In 1852, India became the first country in Asia (and the 10th in the world) to issue its own postage stamps. In 1852, India became the first country in Asia (and the 10th in the world) to issue its own postage stamps. However, and surprisingly, these were not issued in Calcutta, at that time the capital of British India. Instead, India’s first stamps came into circulation in a remote, historic region called Sindh, a province of Pakistan. It was in 1758 that the British East India Company, set up its first base in Thatta, after lengthy negotiations with Sindh’s ruling elites. During the first half of the 19th century, British trading supremacy in this area came under threat from Afghani tribes who attacked Britain’s Imperial interests from the north. To contain these attacks, the British annexed the adjoining regions of Sindh and the Punjab. General Charles James Napier arrived in Karachi (the capital of Sindh) on 9th September 1842, and in less than six months he succeeded in establishing Britain’s colonial dominance in Sindh, following the battle of Miani (17th February 1843). Thanks to his efforts, Napier was appointed as the first civil administrator of Sindh, reporting in turn to the Bombay Presidency. 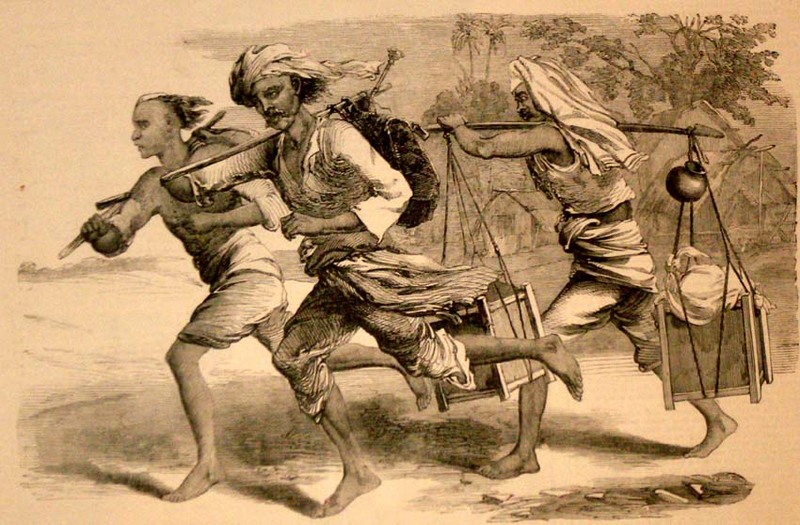 In the various Tamil kingdoms that existed along the Indo river valley, the postal system operated by means of messengers which the British came to call dawk-wallahs. The amount charged for transporting letters varied according to the length of journey required and the weight of the letters, though these amounts were never the same. Curiously, the messengers used to wrap the letters and packages in palm leaves to protect them during the journey. Though this system had been used since time immemorial, it soon proved to be inefficient and unsuitable for the new military and trading requirements of the British East India Company. The trading and administrative infrastructures of the new colonial system required greater efficiency and operability in this new phase of development in the region. And so, the Company’s Administrative Board commissioned Sir Bartle Frere to reform the postal system for this jurisdiction. In 1851, a series of improvements were introduced to reorganise the entire region. Firstly, the postal charges were revised, and a standard rate was set which functioned independently of the distance travelled by the runners. Another noteworthy measure was the routes established along the Indo river valley, where the mail was transported on horseback or by camel. And of course, the new system included the introduction of a postage stamp – the first ever in the continent of Asia, with a face value of ½ anna, and which were issued in Scinde (Sindh, Pakistan). These improvements in the way the postal service operated meant that the state post offices could be linked up, from Karachi to Kotri, on to Hyderabad, and all the way up to Sukkur in the north. However, this new model did away with the traditional messenger, the dawk. One basic feature of this new system was the pre-payment of postage, for which the stamps were required. 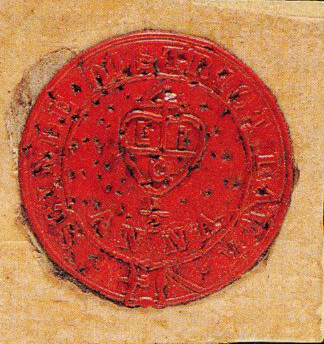 As we can see from the picture above, the stamps bore the Merchant’s Mark of the British East India Company, and at first they featured a design embossed on red wax. However, this soon caused problems, as they broke when the letters were opened. Thus they were replaced with a design embossed on white paper, though this also had to be discarded since it was hard to see in low light conditions. Finally, the design was changed once again, this time featuring embossed blue stamps. In order to standardise the stamps in Britain’s colonial territories of India, Pakistan and Bangladesh, on 30th September 1854 the British postal administration stopped issuing Scinde Dawk stamps. In their place, they issued stamps from the East India Company, which featured the image of Queen Victoria I of Great Britain. With a face value of only ½ anna, the Scinde Dawk stamps are now considered to be one of the rarest classic postage stamps in the world of philately. They are also unique in that they were the first stamps to have been issued in the whole of Asia.